They came from the rolling farms of upstate Pennsylvania and the streets of New York City, landed at Holy Family University, which they called “home” for the week, and had a Nazareth encounter. We call it C.R.E.W (Community Rocks Everyone’s World). 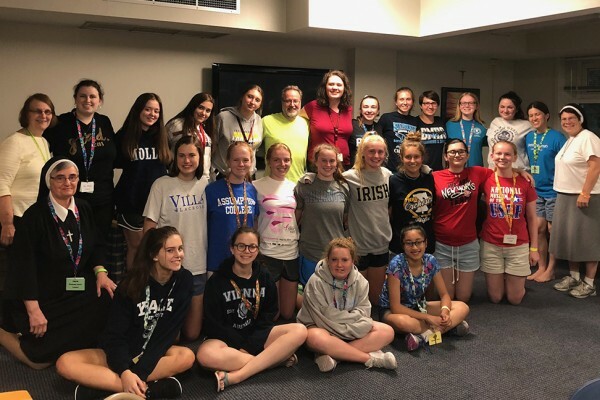 For the past nine years in Philadelphia, and before that, in Monroe, CT, CREW has gathered high school and college age girls, giving them the opportunity to experience the spirit of Nazareth, up-close and personal. This year’s theme “One in the Family of God” reminded everyone of our sacred connectedness to one another and to all of creation. Daily service experiences included ministry with an immigrant family, preparing meals for the homeless, getting hands dirty at a community garden and visiting with Sisters of the Holy Family of Nazareth at Jesus of Nazareth Convent (Mount Nazareth). The week was wrapped in prayer, beginning each day with Mass at a local parish followed by a morning Gospel reflection and prayer. In the evenings, the girls had an extended period of journaling and shared reflection, in order to better appreciate the impact of each day’s experiences. Other highlights of the week included a pilgrimage to the Blue Army Shrine of Our Lady of Fatima with Mass and rosary, a picnic and Holy Hour with our Sisters at Mount Nazareth and a play day at the beach and Boardwalk in Ocean City, New Jersey. And of course, there was the everyday fun of simply being together, bonding, being silly and enjoying life as it happened. Truly, the week held an abundance of blessings and powerful memories for our young participants and our staff. For the first time, our full time staff consisted of two Sisters of the Holy Family of Nazareth, one Associate of the Holy Family, and three CREW alums, who have kept in contact with us and offered their time and presence as adult leaders this year. In addition to our full-time staff, numerous Sisters rolled up their sleeves and assisted with shopping, cooking, games and recreation, pre-CREW preparations and as “Sister Companions” on our various excursions and service experiences. For more information on this week-long service opportunity held each summer, please visit C.R.E.W. on our website.